A U.S. District Court judge in Seattle has certified a national class-action case against Papa John’s International that charges that the company illegally sent 500,000 text messages to consumers in early 2010. Under the federal Telephone Consumer Protection Act (TCPA) of 1991, which bars companies from sending text ads to consumers unless they’ve opted in, class action’s members, if successful in court, could be awarded $500 or more in damages per text, or more than $250 million in total. That would be one of the largest damages awards ever recovered under the TCPA, according to Donald Heyrich, an attorney representing members in the class action. The TCPA also provides for up to $1,500 in damages per violation if a jury determines that violations were willful or intentional. In various reports, Papa John’s’ SVP of legal affairs, Caroline Oyler, has stated that the company will appeal the class-action certification, “aggressively” defend against the suit, and move to have it dismissed. Papa John’s argues that it is not legally responsible for the texting, because it was not a corporate program, but was conducted by third-party vendor OnTime4U and a small number of franchisees. Five franchisees and OnTime4U are also defendants in the suit, first filed in 2010. When Papa John’s became aware of the texting a couple of years ago, it “communicated some concerns that we had” to the franchisees, Oyler told ABC News. But since franchisees are independent businesses, Papa John’s “can advise, but we can’t dictate how they run their businesses,” she said. In court documents, Papa John’s maintains that franchisees make their own local marketing decisions. The class-certification decision by U.S. District Court judge John C. Coughenour states that “OnTime4U apparently told Papa John’s franchisees that it was legal to send texts without express customer consent because there was an existing relationship between the customers and the Papa John’s restaurants,” and that “there is no evidence on the record that any customer who received messages sent by OnTime4U gave consent” to be sent the text messages. 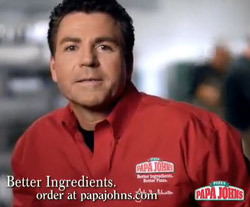 The decision states that certain franchisees provided the text-marketing vendor with lists of telephone numbers of individuals who had purchased pizza from them, generated out of a proprietary Papa John’s “point of sale data entry system” that is downloaded onto registers in Papa John’s restaurants and tracks customer and order information. “OnTime4U removed landline numbers from the lists and sent text messages to the numbers associated with cell phones,” according to the document. In August, Jiffy Lube’s largest U.S. franchisee agreed to pay $47 million in damages to settle a similar text-messaging class action, although it acknowledged no wrongdoing. In the same month, class actions were also filed against The Huffington Post (for allegedly illegal texting) and Dell, Inc. (for allegedly illegal phone calls to cell phones), according to a release from law firm Gilman Law LLP.